Hedley Smyth, Senior Lecturer, School of Construction and Project Management, The Bartlett Faculty of the Built Environment, UCL. Section I Overview in Scope and Context of Managing the Professional Practice. Chapter 1 Structures, management and markets (Hedley Smyth). 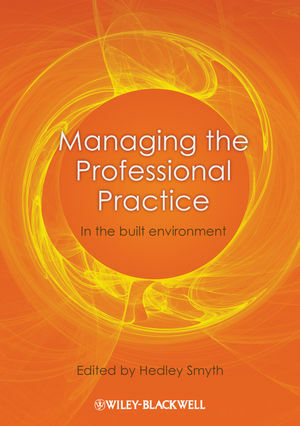 Chapter 2 Strategic management of professional practice: The case of architecture (Graham Winch). Chapter 3 Cross-functional coordination: Conceptual model and its application in professional design practice (Antti Ainamo). Chapter 4 Challenges of growth in a medium-sized engineering design consultancy (Andrew Edkins, James Barrett and Hedley Smyth). Chapter 5 Sustainability into practice: How the sustainable development agenda has impacted on the surveying profession (David Shiers, Tim Dixon and Miles Keeping). Section II Managing Specific Issues in the Professional Practice. Chapter 6 Equipping project teams for competitions: Architecture practices in the Italian market (Beatrice Manzoni). Chapter 7 Client management and identification (Hedley Smyth and Sofia Kioussi). Chapter 8 How thin to win: FM service provision issues (Kathy Roper). Chapter 9 Innovation in professional service providers: UK quantity surveying practices (Stephen Pryke). Section III Reflections upon Practice. Chapter 10 The make experience (Ken Shuttleworth). Chapter 11 Squaring the circle: Delivering international services locally (Larry Malcic). Chapter 12 Innovation in the construction sector (Jeremy Watson). Chapter 13 Managing a project management division (Andrew McSmythurs). Chapter 14 Developing capacity in an emergent market (Robert McIntosh). Chapter 15 Branding professional services: Making the intangible tangible (Kate McGhee). Chapter 16 The first 20 years (Mike Nightingale). Chapter 17 Reflection on the redevelopment of the University of Tokyo Hospital: The last 26 years (Shinichi Okada and Makoto Nanbuya (translated by Junko Iwaya). Chapter 18 Beyond the first generation (David Stanford). Chapter 19 Changes in UK construction professional services firms in the late 20th century (Jim Meikle).